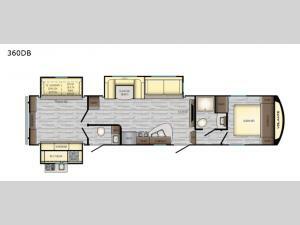 Space, space, and more space can be found throughout this triple-slide Volante fifth wheel. With a rear private bunkhouse, U-shaped dinette, and queen-size bed in the front private bedroom, you can sleep ten people in this amazing unit, and everyone will be able to easily get ready with the full and half bath that this model features. And because one of the two entry doors leads directly into the half bath, you won't have to trek all the way through this fifth wheel just to use the restroom. Enjoy more time outside with your family thanks to the outdoor kitchen, and with the addition of the electric awning with LED lights, you can cook confidently during any weather condition. The CrossRoads RV Volante fifth wheels and travel trailers are anything but ordinary! From the residential wood blinds in the living room and interior LED lighting, to the premium residential furniture throughout, you will be impressed with the Volante from the moment you step foot inside. You will also be thoroughly impressed with the Volante's excellent exterior features, like the fully enclosed and heated underbelly, tinted safety glass windows, and outside shower with hot and cold water that will make it easy to clean up from your fun adventures before heading inside.